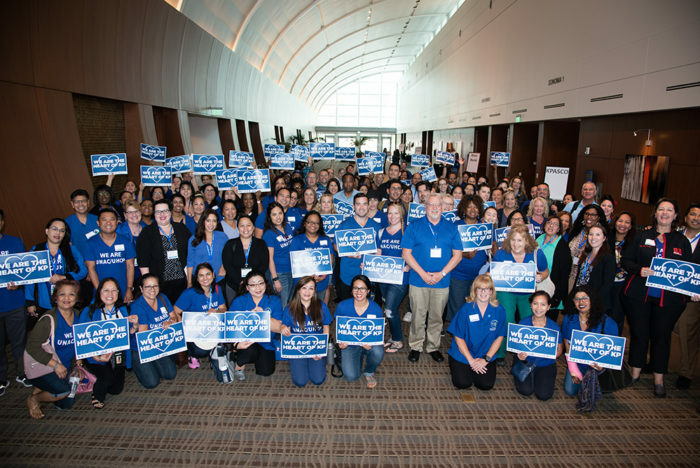 LOS ANGELES—Making history and saving lives, Kaiser Permanente registered nurses ratified a new union contract today that enshrines the best minimum nurse-to-patient ratios in the country. United Nurses Associations of California/Union of Health Care Professionals (UNAC/UHCP) becomes the first nurses’ union to have mandated safe staffing levels embedded in a collective bargaining agreement that are better than California law. The new contract guarantees safer, better care for millions of patients treated each year in Southern California. Hospital units with higher nurse-to-patient staffing ratios had significantly lower incidence of central line IV bloodstream infections, pneumonia associated with ventilators, deaths within 30 days, and bed sores, studies show. Fourteen states currently address nurse staffing in hospitals with official regulations. California is the only state to stipulate minimum nurse-to-patient staffing levels in all hospital units. UNAC/UHCP also negotiated proposals that ensure Kaiser patients get the best care from an experienced and engaged professional workforce. reap the benefit of workers and managers working collaboratively on patient care solutions. UNAC/UHCP also completed national coordinated bargaining in a three-year collective bargaining agreement that covers nearly 48,000 unionized Kaiser Permanente health care workers in 22 union locals. The negotiations were among the largest private-sector contract talks in the United States this year. Collectively the locals—the Alliance of Health Care Unions—emerged with a slate of provisions that improve access and quality for patients receiving care at Kaiser facilities from Hawaii to Virginia.